NAVAL BASE KITSAP BREMERTON, Wash. – Sailors assigned to the aircraft carrier USS Nimitz (CVN 68) had an opportunity to share Christmas dinner with shipmates and family members aboard the ship, Dec.25. 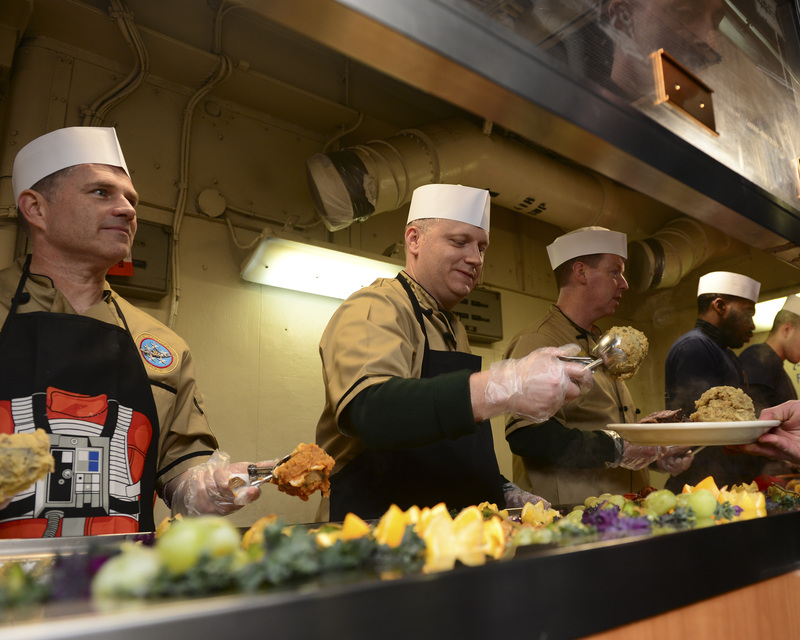 Nimitz’s culinary specialists provided a traditional holiday meal for not only Sailors on duty, but for crew members whose families may be out of the area. Family members also had an opportunity to come onboard to enjoy a specially prepared feast and tour the ship if they desired. U.S. Navy Capt. Kevin Lenox, Nimitz’s commanding officer, Cmdr. J.W. David Kurtz, executive officer, and Command Master Chief Jimmy Hailey, came aboard to celebrate and serve dinner to the Sailors. The meal took hours to prepare and consisted of ham, turkey, lobster, prime rib, various sides and a vast assortment of baked goods. More than 500 Sailors and family members ate aboard the ship in the mess decks surrounded by Christmas decorations and an abundance of Christmas cheer. Nimitz is currently preparing for a planned incremental availability at Puget Sound Naval Shipyard and Intermediate Maintenance Facility where the ship will receive scheduled maintenance and upgrades.